Despite the fact that we bike pretty much everywhere, the kids actually don't ride their own bikes that much. Linnaeus was riding on the road to & from school, plus longer rides on the weekends last summer, but since he got a larger bike with only hand brakes, he isn't road safe again. He needs time to practice & get used to this new bike so that he can stop reliably. But finding the time & place to practice hasn't been that easy. Our back lane is a great place to ride... when there aren't impatient drivers rat running through it. If we go to a park, the bikes get left behind in favour of the playground or the wading pool. We do have a driveway, but it's not really big enough for Linny to ride around that much. 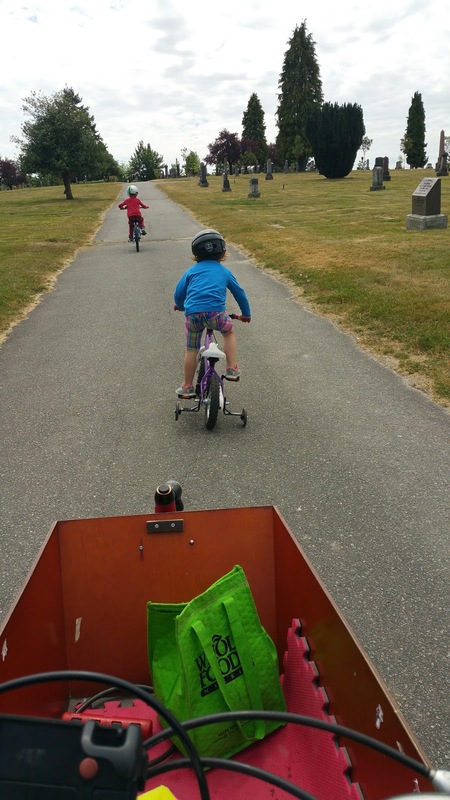 Just a couple of days ago, I decided to bring the kids up to Mountainview Cemetery for a practice ride. 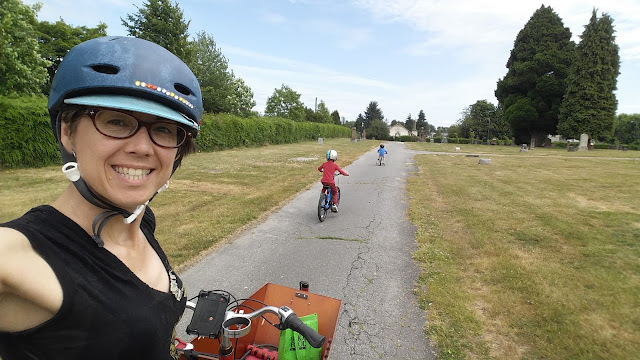 We used to commute to Linny's school through Mountainview while we were at the swing site during the seismic rebuild, but this was the first time we'd gone there just to ride. We towed Linny's bike on our Yuba Mundo & carried Bronte's bike in the Bakfiets to get there, as it's a couple kilometres uphill from us. Once we were in the cemetery, we let them free on their bikes & they rode around for about an hour. If you haven't been there before, it's a great place to learn to ride with lots of paved roads throughout all the sections of the cemetery, but very little traffic. We saw fewer than ten cars in the hour or so that we were there. The hills are great for helping new riders get some momentum up to start pedalling, & also to learn how to do things like standing up to pedal uphill. Because of all the intersections, you can also practice turns & hand signals. After we'd been riding for a while, we stopped in the shade under a big tree for a snack. There isn't a lot of seating like benches in Mountainview, but there are quite a few places with a patch of open grass, so you don't necessarily have to sit right on someone's grave. There are always a few neighbourhood dog walkers around, plus the occasional person driving in to place flowers on a grave, but generally, we have the place to ourselves. The kids had fun & both of them got in some good practice riding, so I think we'll go back more often. Have you ever biked in Mountainview Cemetery? 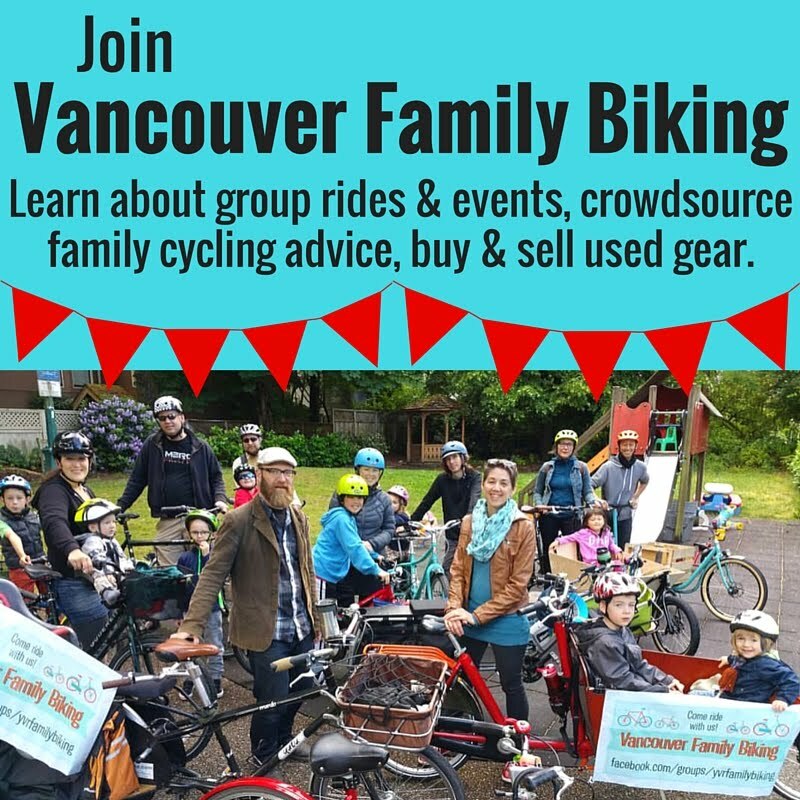 Got any suggestions of other good places for little kids to practice riding in East Van?